Its been a crazy week between work and non-stop getting ready for the fall and back-to-school activities and so I decided to get one thing out of the way: dinner! 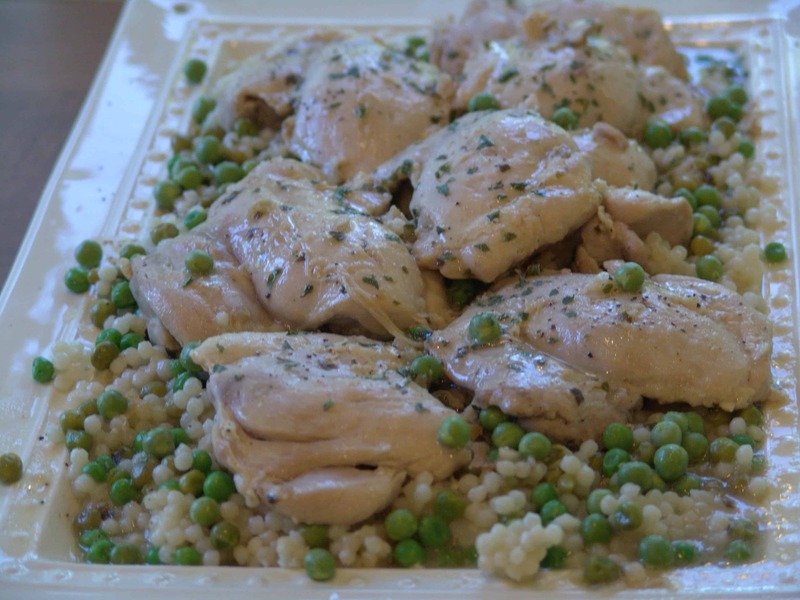 I made this lemon chicken recipe with peas and couscous last night and have it stored in the fridge for tonight’s dinner when I know I will not have a free minute to cook. This way, I will not be tempted to call in a pizza or another form of less than healthy take out. This lemon chicken recipe is one of my family’s favorites and it’s extremely easy to make with only 6 simple ingredients (excluding the olive oil for the pan). It uses boneless chicken thighs making it a budget-friendly dinner. I know some people stay away from boneless chicken thighs- boneless breast is the staple for most of us and it does look so much neater. But there are some advantages to using chicken thighs. For one, it is cheaper per pound and if you prefer organic meats, it helps bring the cost down. Two, because it has slightly higher fat content, it retains its moisture and is a great choice for slow cookers and skillet recipes. But the most important reason is my family LOVES this recipe and I can get it on the table in less than 30 minutes. We also used the Isreali (Pearl) Couscous variety in this recipe as it gives it a bit more substance and it taste delicious with all the extra lemony pan sauce! You could do this with rice or regular couscous too. Heat oil in large skillet on medium heat. Add chicken in single layer and season with salt and black pepper. (Depending on the size of your skillet, you may have to do this in batches.) Brown the chicken on each side, about 5 minutes each side. Remove and place on plate and set aside. Add the juice of 1 lemon to skillet and scrape up browned bits on bottom of pan. Add chicken broth to skillet and stir in the flour until its dissolved. Heat on medium/high heat for 5 minutes until the sauce slightly thickens, just a bit. Return chicken to skillet, along with any accumulated juices, turn heat to medium low, and cover. Continue to cook for 5 to 8 minutes more until the chicken is cooked through. While chicken is cooking, cook the couscous according to package instructions. Add the peas and juice from the 1/2 lemon the last few minutes of cooking. TO SERVE: place couscous on serving platter or bowl. Top with chicken from skillet and then pour sauce over chicken and couscous. Serve with a simple veggie side, such as steamed baby carrots or green beans. Could your schedule benefit from quick, easy and delicious recipes like this? Learn more about The Dinner Daily.